Describe light with its frequency and wavelength. Describe light as a particle of energy. What we know as light is more properly called electromagnetic radiation. We know from experiments that light acts as a wave. As such, it can be described as having a frequency and a wavelength. 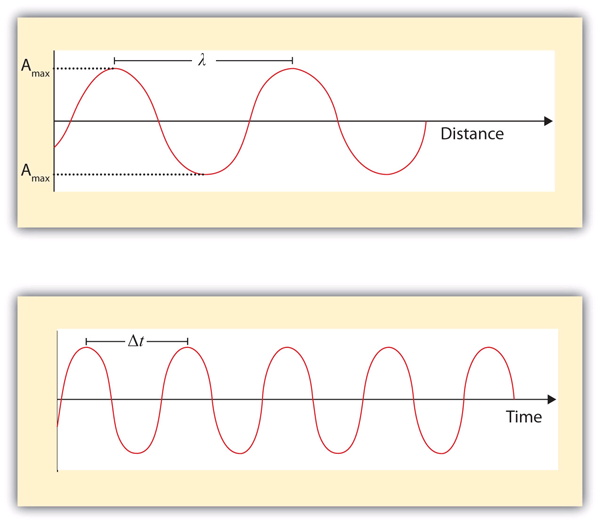 The wavelength of light is the distance between corresponding points in two adjacent light cycles, and the frequency of light is the number of cycles of light that pass a given point in one second. Wavelength is typically represented by λ, the lowercase Greek letter lambda, while frequency is represented by ν, the lowercase Greek letter nu (although it looks like a Roman “vee,” it is actually the Greek equivalent of the letter “en”). Wavelength has units of length (meters, centimeters, etc. ), while frequency has units of per second, written as s−1 and sometimes called a hertz (Hz). Figure 8.1 “Characteristics of Light Waves” shows how these two characteristics are defined. Light acts as a wave and can be described by a wavelength λ and a frequency ν. Because the speed of light is a constant, the wavelength and the frequency of light are related to each other: as one increases, the other decreases and vice versa. We can use this equation to calculate what one property of light has to be when given the other property. What is the frequency of light if its wavelength is 5.55 × 10−7 m? What is the wavelength of light if its frequency is 1.55 × 1010 s−1? where ν is the frequency of the light, and h is a constant called Planck’s constant. Its value is 6.626 × 10−34 J·s — a very small number that is another fundamental constant of our universe, like the speed of light. The units on Planck’s constant may look unusual, but these units are required so that the algebra works out. What is the energy of light if its frequency is 1.55 × 1010 s−1? This is an extremely small amount of energy—but this is for only one light wave. What is the frequency of a light wave if its energy is 4.156 × 10−20 J? Because a light wave behaves like a little particle of energy, light waves have a particle-type name: the photon. It is not uncommon to hear light described as photons. Wavelengths, frequencies, and energies of light span a wide range; the entire range of possible values for light is called the electromagnetic spectrum. We are mostly familiar with visible light, which is light having a wavelength range between about 400 nm and 700 nm. Light can have much longer and much shorter wavelengths than this, with corresponding variations in frequency and energy. Figure 8.2 “The Electromagnetic Spectrum” shows the entire electromagnetic spectrum and how certain regions of the spectrum are labelled. You may already be familiar with some of these regions; they are all light—with different frequencies, wavelengths, and energies. 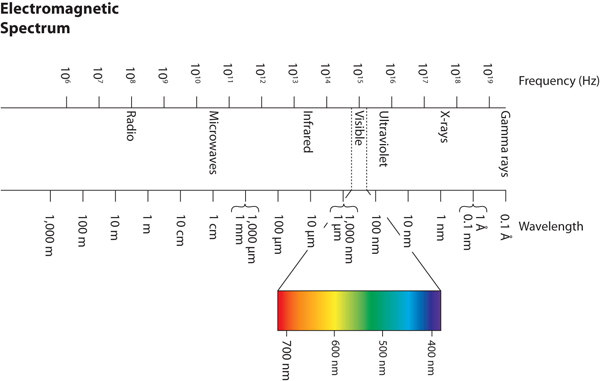 The electromagnetic spectrum, with its various regions labelled. The borders of each region are approximate. Light acts like a wave, with a frequency and a wavelength. The frequency and wavelength of light are related by the speed of light, a constant. Light acts like a particle of energy, whose value is related to the frequency of light. Describe the characteristics of a light wave. What is a characteristic of a particle of light? What is the frequency of light if its wavelength is 7.33 × 10−5 m? What is the frequency of light if its wavelength is 1.226 m? What is the frequency of light if its wavelength is 733 nm? What is the frequency of light if its wavelength is 8.528 cm? What is the wavelength of light if its frequency is 8.19 × 1014 s−1? What is the wavelength of light if its frequency is 3.66 × 106 s−1? What is the wavelength of light if its frequency is 1.009 × 106 Hz? What is the wavelength of light if its frequency is 3.79 × 10−3 Hz? What is the energy of a photon if its frequency is 5.55 × 1013 s−1? What is the energy of a photon if its frequency is 2.06 × 1018 s−1? What is the energy of a photon if its wavelength is 5.88 × 10−4 m? What is the energy of a photon if its wavelength is 1.888 × 102 m? Light has a wavelength and a frequency. Light by Jessie A. Key is licensed under a Creative Commons Attribution-NonCommercial-ShareAlike 4.0 International License, except where otherwise noted.